While there is some suggestion that Pennsylvania might be slowly trending Republican, and while it has a lot of the white, working-class voters that Donald Trump is targeting, recent polling has suggested that Hillary Clinton is obviously the favorite there right now. She leads Trump by close to seven-to-nine points in Keystone State polling averages, which suggests to us that whatever Trump is gaining in blue-collar western and northeastern Pennsylvania over traditional Republican performance is more than being canceled out by his tremendous weakness in diverse Greater Philadelphia and amongst college-educated whites in the state more broadly. Therefore, we’re moving Pennsylvania from Leans Democratic to Likely Democratic in the presidential race, which is where we had it as of a couple of months ago. This doesn’t change our overall total of 347 electoral votes for Clinton and 191 for Trump — precisely where our map has been since we unveiled it March 31. Ultimately, a better Republican candidate might have been able to push the state into the Toss-up column. But right now Trump looks like a poor fit for the state — just like he’s a poor fit for many of the other traditional battleground states. We now have 269 electoral votes — just one short of the magic number of 270 — rated as Likely or Safe Democratic. This just shows what a hole Trump is in: In order to win the election, he has to win all the states currently at least leaning toward him and sweep all of the states just leaning toward Clinton, and all that would get him is a tie. Yes, for a Republican, a tie amounts to a win, because Republicans will control enough House delegations to elect a GOP president in the event of an Electoral College split, as we explained earlier this cycle. 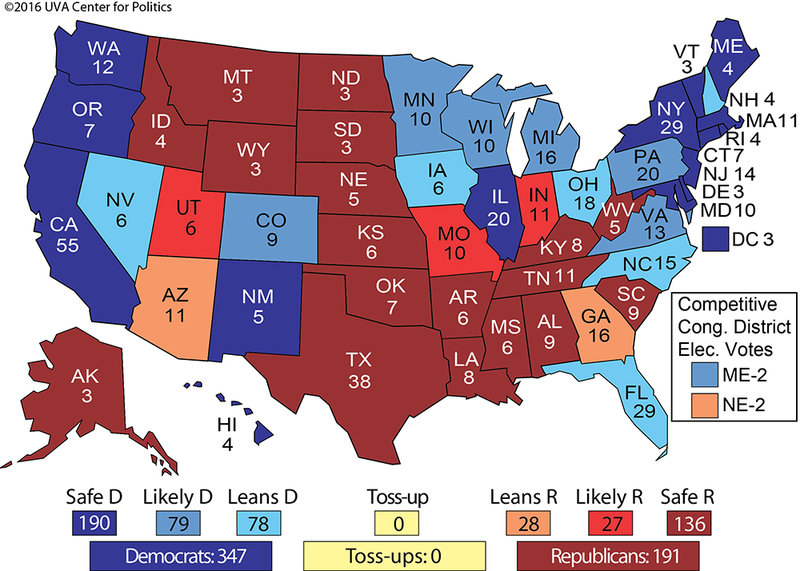 While we have had Clinton as a clear favorite since March, this is the best iteration of the map for her, and it reflects her continued polling success in the aftermath of the Democratic National Convention, as well as Trump’s never-ending string of mistakes, which have likely helped Clinton widen her lead. Additionally, the fact that Clinton and her allies have outspent Trump and his allies by an astounding $91 million to $8 million on television (according to Mark Murray of NBC News) has to be having at least some small effect on the polling. This is where Trump’s lack of a traditional campaign operation is really starting to show. We assume he will be on the air later in the campaign, but probably not at Clinton’s strength for the duration of the race. Nor will Trump have anything close to what Clinton will have in terms of a sophisticated ground game. In other words, Trump is behind, and he may not have many ways to catch up.